During this 2-day wildlife tour, you will be given the unique opportunity to monitor wild elephants in the forest of which there are only a few hundred left in Thailand . Our specialized guides and park rangers will tell you many things about the area's ecosystem, and especially about the elephant. With a little bit of luck, you will also get to see some other wild animals. During the walks and from the monitoring area, you can enjoy absolutely beautiful views and sceneries. Kui Buri National Park is located next to one of the largest national parks of the country, Kaeng Krachan. Both parks are rich in flora and fauna and offer habitat to animals like the tiger, elephant, gaur, deer, porcupine, monkey, wild boar and an incredible number of bird species. 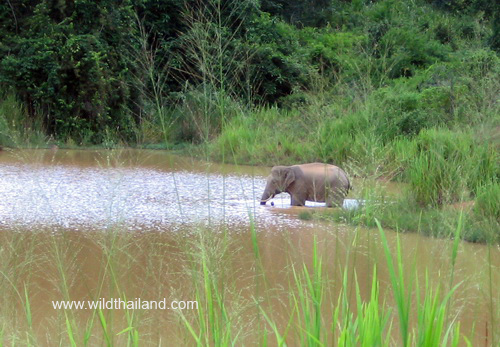 Kui Buri is most famous for its wild elephant watching. Unfortunately, there is still a lot of deforestation around the park, which forces the elephants to move from the primary forest to secondary forest and plantation areas for feeding. The owners of the fruit plantations areas have tried many ways to chase away wild elephants and some have even been poisoned or killed. Fortunately, these days the local people have cooperated with the park rangers in monitoring the wild elephants and to take them back to the forest without harming them. In this way, the local people can benefit from tourism and the elephants have a chance to survive in this park. At 8 o'clock in the morning you will be picked up from your hotel in Bangkok (Transfer from and to other cities in Thailand is also possible). We will travel to Kui Buri National Park . The road towards the park can be a little rough when it has rained and we may need to change to a local jeep for the last 20 kilometers. When we arrive at the park at 11 o'clock in the morning, we will put our luggage in the nature lodge inside the park and have some time to relax. The park ranger will give us very interesting information about the parks ecosystem, and especially about the elephants. Afterwards, we will take a local car to the wild elephants monitoring area. Please bring a binocular with you so that we can see the elephants clearly when they come to feed at the forest edge in the afternoon. Dinner will be taken at the campsite, where we will also spend the night. We wake up early on the morning and head towards the wild elephants monitoring area again. We will wait for the elephants to come for feeding and with a little bit of luck we can also see some other wildlife. We will head back for breakfast and afterwards, we walk along a nature trail to a natural salt lick. During this walk, we can see many animal footprints and have the opportunity to study the parks ecosystem. Lunch will be taken in the forest after which we return to the nature lodge to pack our luggage. Departure to Bangkok is around 3 o'clock in the afternoon and we should arrive back at the hotel at 6 o'clock in the evening.